This year, the seventh annual Sunset Strip Music Festival will expand its street festival component to two days – Saturday and Sunday – and move to September 19-21. Groundbreaking alt-rock pioneers Jane’s Addiction have been named the 2014 SSMF honoree and recipient of the Elmer Valentine Award, which celebrates the music and icons that have made an impact on the legacy of The Sunset Strip. The two-day music festival will kick off Friday, Sept. 19 with an invitation only honoree event hosted by the House of Blues on The Sunset Strip. Following the induction ceremony, Jane’s Addiction will headline the first day of the SSMF street closure on Saturday, September 20 and play Nothing’s Shocking in its entirety. Also rocking the outdoor stages on day one, performances by: Failure, Cold War Kids, ††† (Crosses), Minus the Bear, Kaiser Chiefs, The Birds of Satan, Nightmare and the Cat, Beware of Darkness and Say Say. The two-day street festival will include three outdoor stages, interactive experiences, food, beverage and much more, transforming The Sunset Strip into the ultimate concert destination. Iconic venues lining The Strip including: Whisky A Go-Go, The Roxy and The Viper Room will host live performances for ticketed attendees throughout the day, into the night and after the street fest closes until 2:00 a.m. Entrance is first-come, first-served. 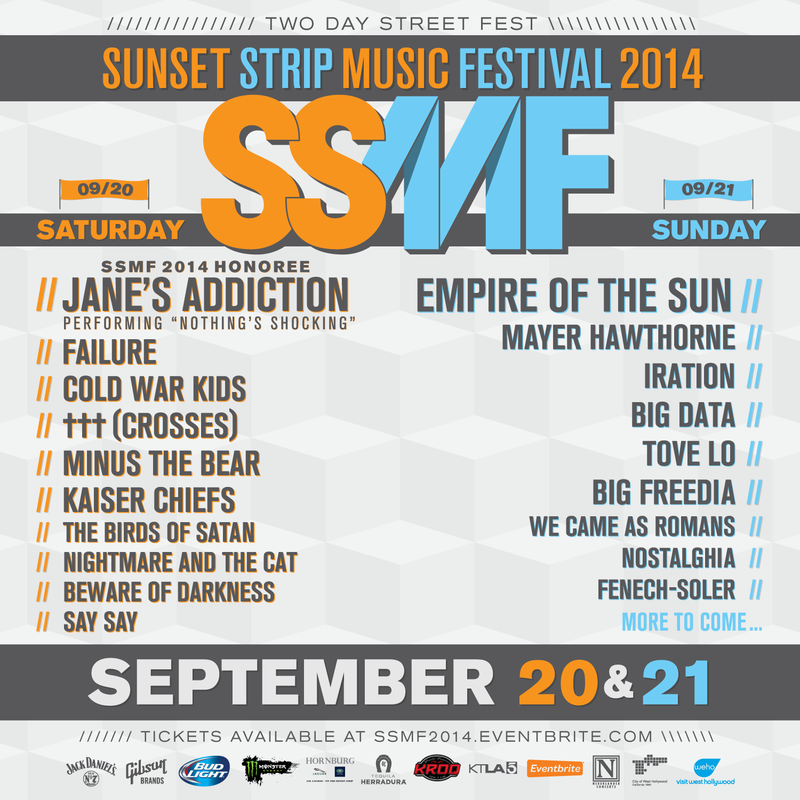 Tickets for the 2014 SSMF street festival are on sale now via our official ticketing partner Eventbrite – BUY HERE. Ticket options include: Single Day General Admission for $75 or a 2-Day festival pass for $125. For hotel accommodations and additional activities surrounding the festival visit www.sunsetstripmusicfestival.com/hotels or www.visitwesthollywood.com. For more information about SSMF, visit www.SSMF.com, www.facebook.com/sunsetstripmusicfestival and www.twitter.com/SSMF.